Indian Amla is rated 4.5 out of 5 by 4. 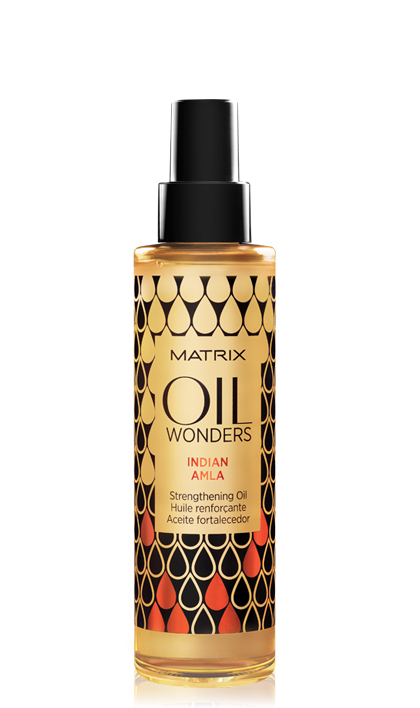 Share https://www.matrix.com/oil-wonders/products/oil-care-collection/indian-amla Indian Amlahttps://www.matrix.com/~/media/new media library/product listing/filter options/product types/haircare/oilwonders/oilwonders_indianamla_ow-ia.jpg Renews fragile, weakened hair for restored strength while enhancing softness and shine. Rated 5 out of 5 by KellyTere from ONE IN A MILLION Product I discovered this last year and this has been a miracle product for my hair! I have dry, frizzy, wavy, curly, hard to detangle hair and this product makes my hair look great, feel great, easier to manage, makes my hair look beautiful and saves me time! Rated 5 out of 5 by Megan G from Amazing Aftermath I've been using this product off and on for over a year. I've tried finding other products and nothing else compares. I can brush thru my hair after applying this, without all the breakage that I normally get without it. Rated 5 out of 5 by Mumtaz Ahmad from Superb results! I bought this one month ago after my hairstylist recommend it. I wearing hijab and tie knott my hair. After using this oil, my hair remain smooth, shining and straight even after a day being tied whilst wearing hijab. I also using it to my daughter. The results very satisfying as her hair not crumble anymore and easy to manage. The texture is difficult to describe but its not oily and the result can be seen immediately. Rated 3 out of 5 by Knafisa_1 from matrix indian hair oil just bought it yesterday my hair is breaking and the lady in the salon told me to use this. i have tried the product wow i like the smell its made my hair ever so soft and shiny so lets see if this product will work WONDERS.